Italy in the thirteenth century was transformed by two new religious orders, the Dominicans and the Franciscans. Whereas earlier religious orders had secluded themselves in monasteries in the countryside and lived off income from their property, the Dominicans and Franciscans settled in urban centers and lived as mendicants, or beggars, administering to the laity. The founding members of both orders took a vow of poverty, yet soon after their deaths their successors were building churches that rivaled cathedrals in size and splendor throughout Italy. The friars and nuns of these orders created a tremendous demand for works of all kinds - painted altarpieces, crucifixes, fresco cycles, illuminated choir books, and liturgical objects - to decorate their churches. The works they commissioned illustrate the lives of their saints and depict miracles such as Saint Francis preaching to the birds, Saint Dominic dividing a single loaf of bread into enough food to feed many hungry friars, and Saint Clare rescuing a child mauled by a wolf. 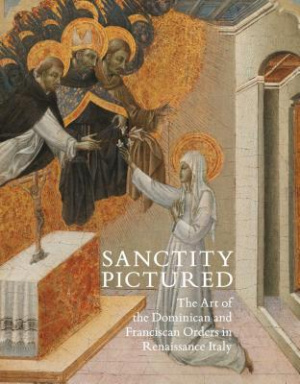 Sanctity Pictured by Trinita Kennedy was published by Philip Wilson Publishers Ltd in October 2014. The ISBN for Sanctity Pictured is 9781781300268. Be the first to review Sanctity Pictured! Got a question? No problem! Just click here to ask us about Sanctity Pictured.